Every year around this time I hear horror stories about primary grade children having several hours of homework each evening. The child ends up crying - the parents end up yelling – what’s the point? First of all, if a young child goes to school and sits and listens and works and learns for six hours, they deserve to do what they want when they get home. The need to play, move, laugh, yell, imagine, and be KIDS! Homework should teach children responsibility. Homework should be a tool to help parents see what their child is doing at school. Homework should extend learning from the classroom to the home. Homework should be MEANINGFUL! If I were in charge of the world, primary grade children would NOT be allowed to spend more than 30 minutes on homework each night. They might be asked to read 20+ minutes and then have ONE other assignment. I would try to make the assignment engage with the parent and connect the real world with what’s going on in the classroom. For example, the assignment might be to ask their parents what a veteran is and to find out who the veterans in their family are. The assignment might be to ask their parents how they use math in their jobs. The assignment might be to cut out a picture from the newspaper and write one or two sentences about it. Drill and kill worksheets should be banned! My daughter brought up the point that many parents WANT homework and are impressed with lengthy assignments because they think it will make their children smarter. In the book Battle Over Homework: Common Ground for Administrators,Teachers, and Parents, Harris Cooper put together a variety of research studies on homework. He found that in elementary school, homework has almost no impact on academic achievement. In middle school, the results are mixed. In high school, moderate levels of homework can help the learning process. 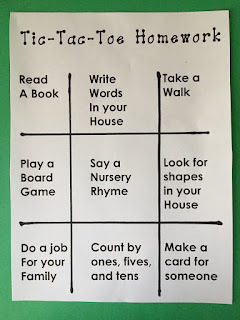 Here are some ideas that might encourage children to develop responsibility and positive attitudes about homework. Tic Tac Toe HomeworkMake a tic-tac-toe grid and put a different assignment in each section. Children can do as many activities as they choose, but they must do at least 3 to get tic-tac-toe by the end of the week. Hint! This is perfect for the parents and children who actually “like” homework because they can do all nine. You will need a pocket folder, crayons, and markers to make a homework folder. First, let children decorate the outside of their folders. Trace around their “left” hand on the left pocket. At the end of each day children put completed work in that pocket and it is “left” at home. Trace around their “right” hand on the right pocket. Use a homework sheet similar to the one below. Fill out assignments for the whole week and place it in the “right” hand side of the child’s folder on Monday. On Friday save homework sheets in children’s folders. Review with parents at conferences. Each child will need a clipboard that she can decorate with her name, stickers, etc. Each night clip the homework assignment to children’s clipboards. (Think outside the box with interactive activities, rather than worksheets!) Make sure parents know that their job is to look at the clipboard each night, help their child with the assignment, and send it back to school the next day. Send a calendar home at the beginning of each month and ask parents to complete at least ten activities and return by the end of the month. Note! You can download these free on my website drjean.org. and all things school related! School is one of the best distractions for me. It gives me focus. I am ever so grateful to have a job that I love. I'm creating new things for the end of the year, working on wrapping up the end of year with a bang with my Kinder-Hoppers, and also, thinking about all the new and fun things that I will implement next year! I believe that once upon a time I had said I would post what I do for homework in my classroom, so today is the day! I begin sending homework home in September. It's a HUGE packet for the entire month. Here is the explanation of homework that I send at the beginning of the year. The Homelinks are part of Everyday Mathematics. I cannot post the Homelinks, please do not ask me to post them or send them to you. They are copyright protected. 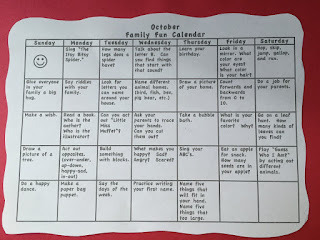 Beginning in October, I have students practice writing a letter each week. I send the practice sheets home attached to the homework calendar. We use Zaner-Bloser Handwriting. These are also copyright protected, but I am sure you could find practice pages to use. I've gotten LOADS of questions about how to get parents/students on board with completing their homework packets, and unfortunately, I have no miracle for you. I will tell you that each year is different. Some years I have wonderful participation and others are not so great. I give a very lengthy talk at Kindergarten Orientation about why homework benefits our kiddos and my expectations. I also give students incentives to complete their packets. If they return the calendar with 5 initialed assignments a week, they get stickers stapled to their calendar. When they turn in their family project, I usually will give them one Smartie (that's right...a single Smartie, lol, it does the trick). Their Book It count is also on the bottom of the calendar, which is a motivator, as well. I really try to make a big deal out of homework that is returned, but to be honest, I do not make a big deal out of homework that is not returned. I just don't believe that holding a five or six year old completely accountable is appropriate for my classroom dynamic. Here are the calendars for next year, yipee! One thing I can cross off for next year, exciting!! I have attached the games and such that I have, some I haven't had the chance to adjust yet or create yet. I hope you find something that you can use for your classroom. I don't mind if you change them or just use pieces to suit your needs, but please, please, please, give credit when it is due and do not sell or post them as your own. I love all the comments and emails, you all make me feel so loved. I truly appreciate it! If you download or use anything, please leave a comment. Thanks so much!